Mini-cakes, Swiss-roll, Mary Berry’s Cherries! Great British Bake Off klaxon PAAAAAAAAAAAAARP! Stand by for bakey blogs! Bring out your sugar thermometers! James groaned audibly when he heard GBBO was returning. I’m not surprised really – the poor guy knows exactly what this means. Weeks of being ignored and shushed on Wednesday evenings when he staggers through the door at gone 10pm after a hard day’s graft in the Kitchen to find me frothing at the mouth watching it on catch up and mumbling about creme-pat (do you like that little bit of bakey slang there? Covering the fact that I have frankly no clue what creme-pat is). Weeks of me stockpiling random baking ingredients (26 types of sugar, 12 types of flour and some yeast) that can already be found in the back of the cupboard in the Bake Off 2013 extravaganza section. 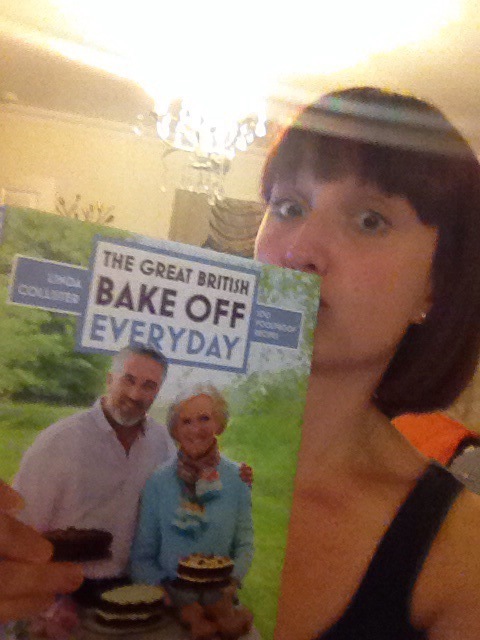 Weeks of botched baking after I run to Sainsburys shrieking to buy the discounted 2014 GBBO recipe book and then under or over-bake every recipe like an idiot. It seems quite a commonly acknowledged thing amongst other nationalities that we Brits are bonkers. And I have thought for a little while now that Bake Off is a perfect illustration of this perception. I’m not sure that in any other country you could drive the majority of the population into a total frenzy by rocking up in the middle of the countryside, pitching a massive tent, stocking it with pastel coloured baking equipment and filming a load of people baking cake. No-where else surely do thousands of people apply for 12 long weeks of gruelling, competitive baking. No-where else would find people from across the country chewing their fingernails and holding their breath over the folding of a Swiss-roll, or the distribution of cherries through a sponge ring. No-where else would we all cry along together when a poor contestant’s cake goes arse up. No other nation would get itself so giddy, so fraught, so tense, so ecstatic about baking. It is quite Britishly, brilliantly potty. It is our little bit of late Summer early Autumn madness, and I love it. All together now ON YOUR MARKS! GET SET! BAAAAAAAAAAAKE!